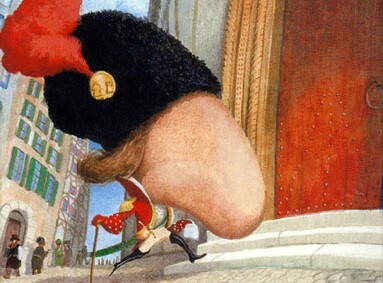 The Nose is a satirical short story by Nikolai Gogol, a famous Russian writer. Though totally fictious, story is naratted like an absolute reality. Except for the 'Nose', everything else in the story seems to be real. Blended with sarcasm, the story attacks the ignorance of people, especially learned men. The author insists through the story that writer must write something that is useful to the society, something that uplifts the culture, helps the progress of mankind. The main character in the story is Kovalev, a Government Officer in general. But the story starts with Ivan Yakovlevitch, a barber who shaved Kovalev twice a week, finds the nose of Kovalev in his daily piece of bread!! Demoralized by the scene, Ivan gets rid of the nose by throwing it into the river. Thus the story begins! That morning, as usual, Kovalev wakes up from his bed and reach the mirror, only to see the unusual disappearance of his nose! Yes, his nose that rests between the cheeks!! He sees a flat, smooth surface at the place of his nose. Horribly frightened, Kovalev sets out to register a complaint about the great escape of his nose. 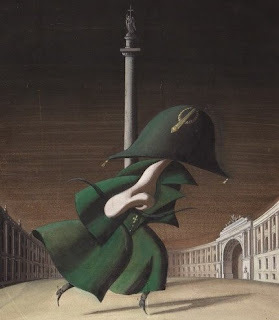 As he walks through the street, he finds his nose, dressed like a State Councillor, roaming through the streets in a carriage! Astonished Kovalev follow the carriage and meet the 'Nose in disguise' at Church. Kovalev hesitantly asks the 'Nose' to return to its original place. The 'Nose' couldn't make out a thing of Kovalev's words and hence ignores him. While Kovalev's sight falls towards a beautiful lady for a second, 'Nose' takes this chance to escape form the scene! Kovalev continues his search for his nose and decides to advertise it on Newspaper. But the man at the advertisement section refuses to take his advertisement, for it would reduce the trustworthiness of the Newspaper. Kovalev's all attempts for the day fail and he returns home. But this doesn't end here. Kovalev thinks it must be the dirty work of a witch, hired by Madame Podtochina, wife of a State Officer, whose daughter he refused to marry. Kovalev writes a burning letter to Podtochina to set everything right otherwise to face the consequences, But when he recieves a respectful and calm answer, Kovalev comes back to reality. Meanwhile, the loss of Kovalev's nose becomes a national sensation. Many rumours were set to air. Our poor Officer regrets whole day for the loss of nose. He couldn't step out of his home anymore. What happens next? Will our 'Major' Kovalev gets his nose back? Could he ever again talk to ladies without his face being covered? You have to read the story to know answer to these questions. The narration of the story is simply beautiful. Each and every scene are picturised in a realistic manner. The concept of 'Nose' escaping from the face itself is an interesting thing. You will burst into laughter reading the story. And if you touch your nose to confirm its presence and if found missing, author is not responsible!